I like the flavor better as is, but I wonder if this wouldn't play better choosing a card type instead of a name. It subtly helps you find what you need over the long game, but it's mostly going to feel like the well never grants your wishes. I would definitely try both versions before settling on one. Would need to cost more that way (but that's fine). I like that this can be used effectively early game to find a certain basic land, and that it will lead to some good stories when you use it to help find the one card that will help you out of a losing situation. I'm not sure if those two scenarios will occur often enough to make this worth it, but I would probably try it out. This seems like it could be playable, often naming a basic land to fix your mana. But keeping/removing the top card seems like too little reward, and drawing the wished-for card seems like a better flavor fit. What about combining the designs? 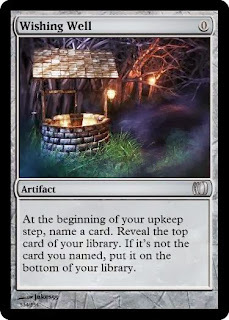 At the beginning of your upkeep, name a card and reveal the top card of your library. If it's the named card, put it into your hand; otherwise, put it on the bottom of your library. It doesn't seem like it should be broken at this cost; you have a 1/15 or less chance of hitting every time, unless you're naming Relentless Rats or a basic land (in which case you probably have other problems to deal with). In Limited it would mostly be mana-fixing (that incidentally rewards you for knowing your deck well); in Constructed it's possible that control decks would run it to dig for answers and/or extra lands. The trouble with this version is that it's SO easy to abuse. Scying into more scry cards works in Limited, but /much/ easier is /any/ effect that lets you reveal or look at the top card of your library every turn (or whenever you like). True. But most environments don't have ways to abuse the top of the library; scry is the exception rather than the rule. Miracles, for example, also have this property, and Wizards made them work just by not printing good library manipulation while they were in Standard. To clarify, the version I proposed is not for casual players, it's for Spikes and Johnnies. Another option: if the card matches, you could draw it and sacrifice the well. I couldn't find a flavor for that, but otherwise I like that a lot. Wishing Well meet Temple Bell... or just a more fantasy-compliant Howling Mine. 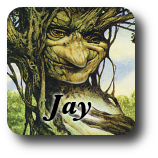 At the beginning of each player's upkeep, that player names a card and reveals the top card of their library. If it's the named card, they put it into their hand; otherwise, put it on the bottom of their library. This should be called Schröedinger's Topdeck. I really like it. When Wishing well comes into play name a card. At the beginning of your upkeep reveal the top card of your library. If it's the named card, put it into your hand; otherwise, put it on the bottom of your library. 3-Wish for a different card. Less abusable but still nice payoff when you hit? Yay! Wishing Well is definitely a concept that needs to happen, and what you started with here is pretty strong. Multiple wishes can be done with the wishing well? Hmm. I really like this design a lot. however my only complaint is that this should be optional. gimme doom blade... oh, it was go for the throat? well... sh** now I need to tuck it. "Name a card, then scry 1. Which card you named is irrelevant." If you name card types instead, that might be better.